I have an obsession with tulle. So I thought I would use some of the tulle around my house. Actually, put it to good use. 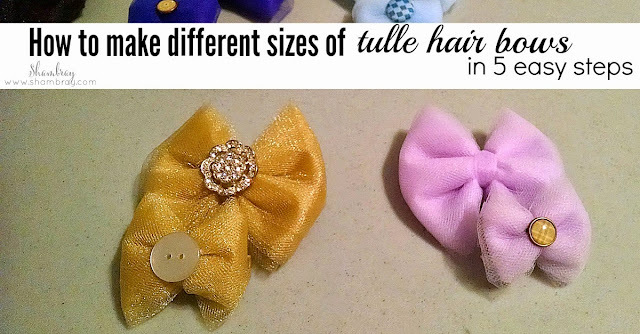 I ran across a blog post that was all about making tulle bows and I thought I would give it a shot. They are so easy! I want you to believe me too. I have NEVER made a bow for my daughter's hair. Never. I always thought it was easier to buy them. Ok it might be slightly easier to buy them, but honestly I pumped out 12 hair bows in under 2 hours! That is less than 10 minutes per bow! The other perk was that I had every single supply at home. Like I said before, I followed the link above for the tutorial. If you want to make bigger bows then wrap the tulle around four fingers (like the tutorial shows). The smaller bows that I made were wrapped around 2 fingers. 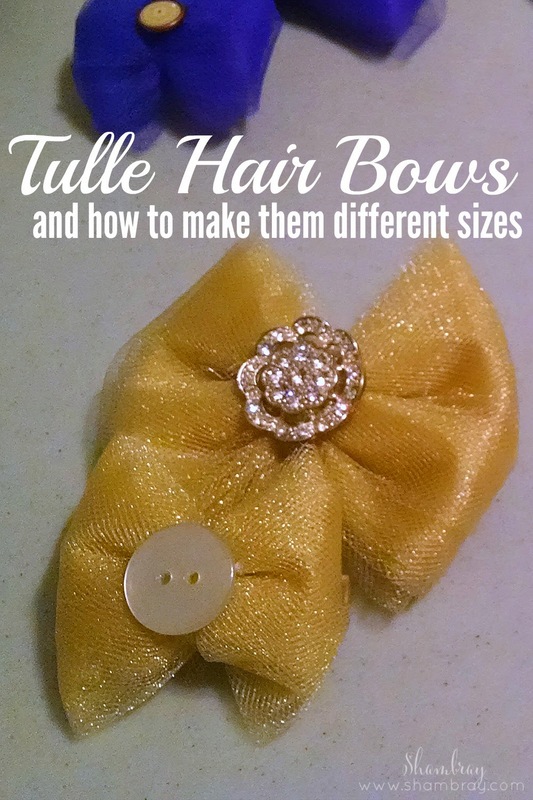 I did this so Hannelore could use the bigger bows and the baby could have a matching bow that was smaller for her head. The next step is the same as the tutorial as well. 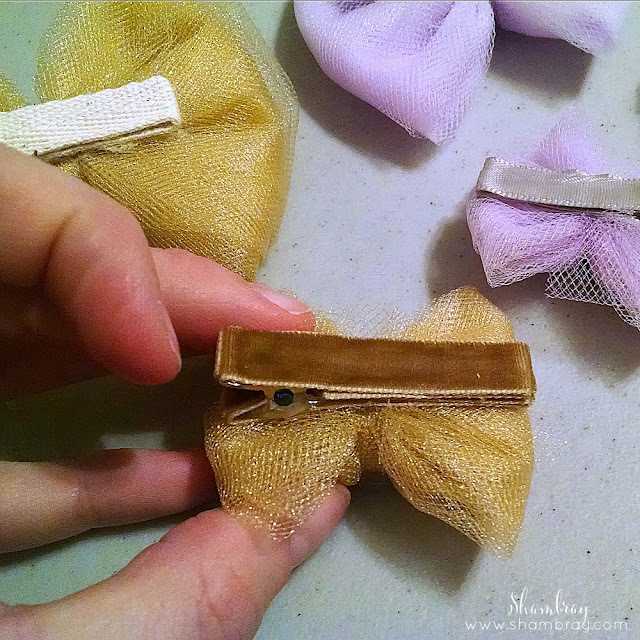 You will wrap a thin piece of tulle around the bow and tie a knot in the back to secure the bow. Don't pull the tulle too tight or it will break. If you like the way they look without a button on the front then you can stop there. Or you can add something to the front to spice it up. I did it both ways, depending on how the front looked. If you want to add a button then you will hot glue the button to the front. Next, take you clip and wrap it with ribbon using hot glue. I like to wrap the front and back of the clip with ribbon. I also carry the ribbon piece to the inside of the clip. That way it is soft against the head. It also helps with the clips not pulling any hair. Lastly, hot glue the ribbon wrapped clip to the back of the bow. Like I said these are so simple and so very quick. I was very surprised how fast I got done with making this cute things. Hannelore is so excited to have matching bows with baby sister too! 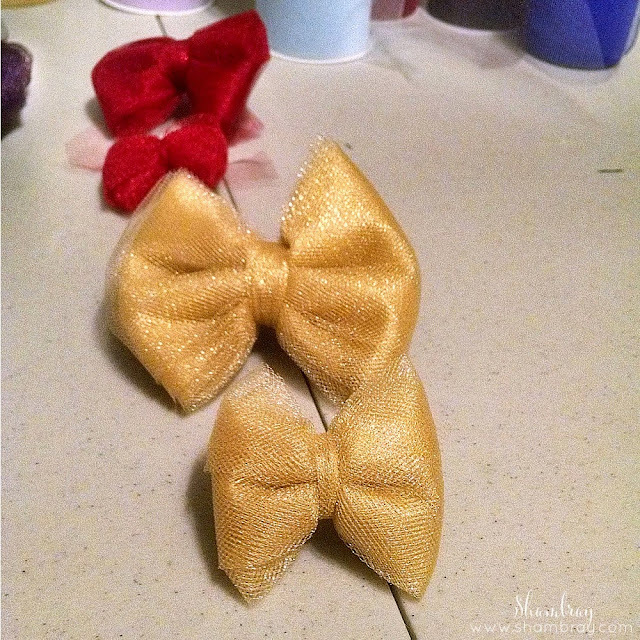 I plan on making more bows with different material so check back in the months ahead.